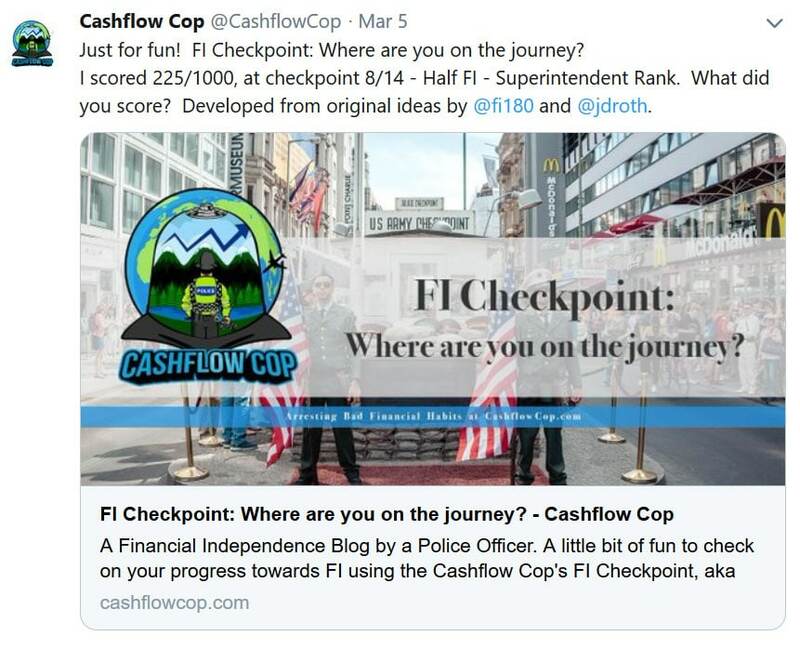 It comes from a newer blogger on the scene, Cashflow Cop (such a good name! ), who was inspired by posts from Joel at FI 180 and JD Roth at Money Boss. Link to take the test below, but fair warning – it may get depressing as I scored a paltry 6 out of 14, and that’s with a net worth of almost $900k! Is this income greater than your expenses? Do you have a three-month emergency fund? Do you have any rolling credit card debt? Do you have any overdraft debt? Do you have any vehicle finance? Do you have any other consumer debts excluding mortgage? Do you have a six-month emergency fund? Do you have a one-year emergency fund? Do you have an emergency fund of two or more years? Do you have any mortgage debt (excluding income producing properties)? Is your passive income at least 25% of your expenses? Is your passive income at least 50% of your expenses? Is your passive income at least 75% of your expenses? Is your passive income at least 90% of your expenses? Is your passive income at least 100% of your expenses? Is your passive income at least 1.25x your expenses? Is your passive income at least 2x your expenses? Is your passive income at least 10x your expenses? Checkpoints 7 and up are basically dependent on how you answer all the passive income questions in that second half of the list there. If you wanna give it a shot here’s the link again, and then be sure to come back and let us know how you did… Maybe it’ll give you some much needed motivation over the weekend? Or a nice pat on the back? I order you to fetch me a beer – stat! Stability Sergeant here too…..trying to advance to Inspector level in the next 2 years. you’d be sitting pretty if you can advance to each level in 1-2 years! though I surmise it would go much faster towards the end with all that compounding working in your favor. I’m not sure I entirely understand the passive income part? Any insight? Example: dividend income from stocks, rental property profit (even though you still do work), royalties from stuff, etc. In theory if you can cover all your expenses with passive income you’re technically “financially free” – ie you don’t have to work anymore because everything’s covered! but of course it’s a bit more complicated like that, and doesn’t account for other variables or assets too you can tap that doesn’t pay dividends (cash, stocks, real estate, etc). Oh ok that makes sense. My result was 52 Stability Sergeant. Feeling pretty good about being there at 28 and really only becoming somewhat financially knowledgeable (still so much to learn) in just 1 year. I also got stability sergeant. I got 405 with no rank. I guess I found a bug. Hopefully it’ll be back soon, but in the meantime you could prob guess where you land :) Probably somewhere in the Commander/Commissioner range? The cop was at Superintendent with 225 points. I need someone to give me some tough talk. I am at a career crossroads, and don’t know what to do. We have significant non-mortgage debt. We are doing fine month-to-month and have no trouble making minimum payments, but we are years (8-10) away from eliminating the debt at our current rate. We live overseas as expats, and I am the trailing spouse. We move every 2-3 years for my husband’s job, sometimes back to the US, sometimes to other overseas posts. Here at our current post, I was surprised to be offered a part-time job in my speciality (nursing) that pays an okay salary and would keep my certifications and license active. It would pay down some of our debt and make it easier to find nursing work at our next post, assuming a job is available (honestly, it’s pretty unusual in most overseas locations). It’s only 25 hours a week (once you add in commute time). We’d incur some added costs for childcare, but otherwise, it would give us some immediate breathing room. Seems great. But my dream is to pivot into being a full-time writer and homeschooling mom to my two very young kids. I used the first six months of our time overseas here to draft my first novel, and I’m ready to continue editing, studying, and refining my craft. I’m aware that this is a long game, but my writing teachers say that if I am willing to really invest my time for the next 3-6 years, I could likely make a full-time career out of writing, and one day, teaching online writing classes. That would be my dream! While I was writing my novel, I couldn’t remember ever being happier. In the short- to medium-term, I want to blog about homeschooling as an expat to provide income, but I estimate it would take at least a year to get off the ground. I am confident I could make a reasonable income from blogging, as I have a solid business plan, strong market research, a list of products I could provide, and a target niche. I honestly believe I could make the same amount of money from blogging as I could in this low-paid nursing job, but it would be a dicey year in the meantime, and it means letting my nursing resume lapse. I’ve done professional editing in the past, so I know my needs in terms of writing successfully. Based on my performance writing my novel draft, I need about 15 hours a week to write in order to maintain momentum and 10 hours a week (minimum) to get my blog off the ground. Add in another 15 hours for the actual homeschooling (so I have something to write about), and that’s easily a full-time job right there (not to mention providing just basic daily care to my kids). We’d save a little money because we wouldn’t be paying for private school overseas. I’ve looked at the schedule every which way, and something has to go — either the nursing job, the novel, or the homeschooling/blogging. But it feels irresponsible to pass on this nursing job, when it’s such a rare opportunity overseas and would help pay down immediate debt. We’re only overseas for a few years, and there’s no guarantee that I could delay the writing goal until our next post — after six tours in this lifestyle, I’ve learned that some tours allow for cheap childcare/low cost-of-living and others leave us scraping by. (Note: we are currently in a VERY low-cost-of-living country.) We never know where we’re going until just a while before we leave. I’m a hard worker and I course-correct quickly, and I know that whichever course I choose, I will be successful, barring an unforeseen act of god (huge medical emergency, etc.). But I have to let something go, and I feel paralyzed about the decision. Choose the safe route, take the nursing job now, and hope that life will make space for my writing dreams…one day? Take a risk on writing and homeschool/blogging, with the possibility of the dream life (SAHM, part-time career online that travels with us, pursuing my dream job) BUT the risk of a growing gap on my nursing resume and continued debt in the meantime? What’s a responsible person to do? What about the side of me that wants to show her kids that it’s important to take risks and follow your dreams? My homeschooling friends encourage me to pursue my passion. My nursing colleagues are aghast that I’d turn down such a rare opportunity to keep my resume filled in the traditional way. I need some advice from someone outside of those two biased groups. Side note: I’m so angry we have this debt, as it wouldn’t even be a debate if we were financially stable — I’d write and stay home. Husband just wants me to be happy, but is terribly worried about the debt (as am I). well as a blogger living out his passion you know what my answer will be (TIME TO GO ALL IN ON YOURSELF!!!! YOU NEVER KNOW WHAT CAN COME OF IT!!) but seeing how this is a $$$ blog I’m sure you’ll get some responses more aligned to the “responsible way” as you say :) And we all know what the answer to that one is. to me it’s really about what hurts your soul more – carrying loads of debt or not chasing your dreams? if your anxiety is through the roof on the debt then it’s prob better to just do what you have to to finally get rid of it forever, but if the idea of not pursuing your dreams is the worst thing you can imagine, then hopefully you can figure out a way to deal w/ the debt until you make enough to put dents in it. my two cents anyways, but i agree it’s time to pick one and get going because the “what if” game will drive you to insanity. I offer a very sober perspective on the “responsible” (I guess we’re calling it that!) side of things. I have multiple friends doing the homeschooling route which I think is very cool. But one of them with many kids has run into a terrible home situation which, I won’t get into details, is the equivalent of the loss or disability of the earning spouse and she’s been out of the workforce for many years. Lots of bills, lots of kids, and they’re losing most of an income. It’s a really tight and scary spot to be in. If you were my best friend, I would encourage you to eliminate the worrisome debt first and then do the heart thing when you’re in a more stable position to lower your risk. The phrase “you can have it all, just not at the same time” comes to mind:) I would not want to have a new baby with so much financial insecurity, but that is just my perspective. You went through so much sacrifice and work to get the nursing degree, seems a shame to let it lapse and lose such a great vocational skill. I am older now and I see in hindsight a lot of times in my younger years I was in such a hurry to do things, thinking I would lose the opportunity, and now I see that there was plenty of time to do everything I wanted if I just had more patience and foresight. Try using Everydollar.com to craft a budget (it’s free) to help with your immediate financial concerns. I wish you the best! Not bad for starting at $20K in the hole in 2002. I paid that off in 3 years and never looked back. I’m at Sergeant right now but am selling my house, which I do own outright, and moving into a beautiful apartment complex. Kids are grown and I am a widow and am just not into this suburban life anymore – so far from everything I do and the neighborhood is on a downswing – so I am moving into a city center-like area with lots and lots of trees, by the river and all its activities (farmer’s market, restaurant, dog park, etc), parks, trails, in a much nicer area of town and less than 10 minutes from work. It was a big decision to do this but it is right for me now. Any condo or townhome I could buy just didn’t appeal to me because of locations. So, apartment life it is, just me and the husky, and I seriously can’t wait to get out of this place. I will be buying a new car with part of the house money but otherwise it will be tucked away (which is why I came here, so I can develop a plan to make that big new lump grow). I also actually have a pension (from my deceased husband) kicking in this next month which will mostly pay for the apartment, making most of my income free other than electric, water, insurance, yeah. So I guess I will be stepping down to Constable because technically will have a dwelling payment again, right? Otherwise would be in the debt free zone. 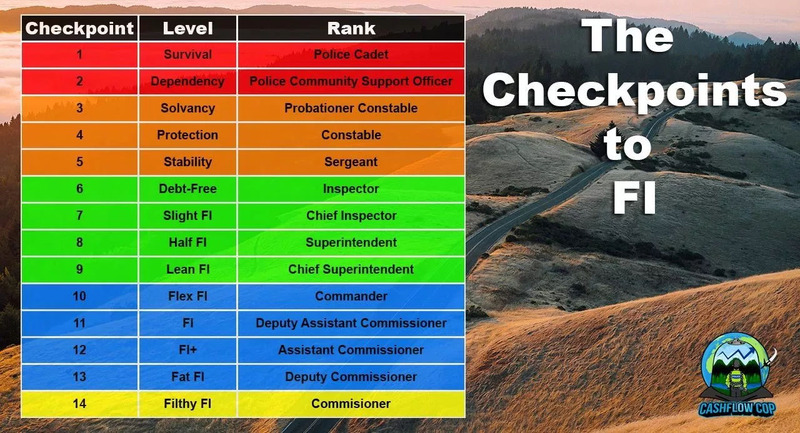 Well, getting back to the game – I got 9/14 – Chief Superintendent. that’s a nice position to be in! Stability Serg here! I left the mortgage debt as yes because I am (by choice) a renter; I figured that probably counts as yes and ran into the same dilemma as you with the investments. Fun game an interesting idea though. On the serious side, it gave me a little more appreciation at where I am. I mean ‘overdraft debt’? Is this something people actually track as a debt? I can’t say I haven’t had my BAD blunders over the years with money, but overdraft debt? Ouch. I know – there’s a lot of nonsense going on out there :( so glad i’ve learned from all my fails too! Why does Suzy Orman not like FIRE?? But are they tears of joy or sadness? Actually, as someone who has never calculated her FI number (THE HORROR! ), this was fun and painless…and actually insightful. But mostly I’m just swinging by to say thanks for sharing this and getting more eyeballs on it. You inspire me so when it comes to supporting new bloggers and spreading important money messages. Thank you, everyone, for giving it a try and being so positive about it. I know it is not perfect and I’ve taken all your feedback on board. I hope the test at least put a smile on some faces and help those new to this to start thinking about how they can improve their financial position. A major update is coming soon. That’s what it’s about, my brother…. Just trying stuff out and coming up with ways to motivate people! I had a lot of fun with this!